Get your phone number (or anything else you want!) embroidered on your dog’s gear. You can personalize any of our premium Sportso Doggo style collars, leashes and harnesses, and the NEO, BroadBand and NEO BroadBand harnesses. They are all made from a soft, smooth and robust Satin-Finish Nylon that you and your dog will love. They are also our strongest harnesses: the Sportso and NEO are 1 inch wide and 3800 pound test, the BroadBands are 1.5 inches wide and 5700 lb. test. Why customize? Click for more information. A phone number embroidered on your dog's collar is The First Way and The Best Way to keep your dog safe and to get them home fast. Easy to read large numbers and letters for fast identification. Because your dog can’t speak. WOOF! 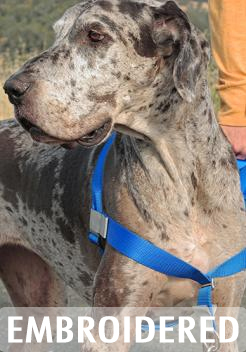 The BroadBand Big Dog Harness: Think BIG. Think LARGE. Finally a dog harness designed to fit our BIG DOG friends! Now get it with your phone number, something practical (Service Dog, Therapy Dog, your dog's name) or fun (Best Dog Ever!) if you already have a personalized collar. Easy to read super-large numbers and letters for fast identification. Because your dog can’t speak. Safety: Because your dog can’t speak, an embroidered collar with your cell phone number is a simple and effective way to help get your dog home quickly. More than identification, it provides contact information vital to your dog’s security. These numbers are large and easy to read, and can’t be missed, so it is a great First and Best way to a happy reunion*. Identification: Many dogs need to be identified because of their jobs, temperament, or other factors: Service Dog, Therapy Dog, Search & Rescue, Please Don’t Pet, Deaf Dog, etc. 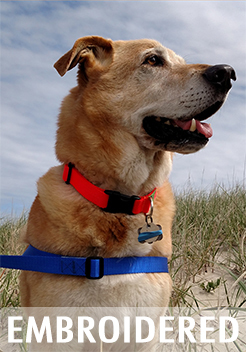 A personalized harness, collar or leash will let you do that. Fun: Sometimes we just want to have fun - or we need to tell which harness belongs to which dog! 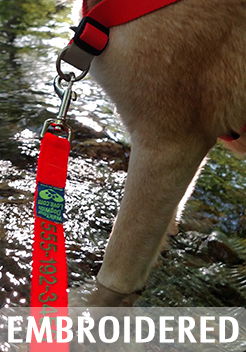 Whatever your case might be – getting an embroidered harness or leash could be just the thing! For your personalized message, choose from 5 thread colors. 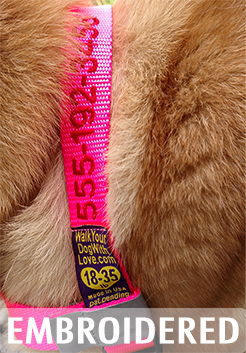 *Embroidered collars with a telephone number are part of a comprehensive “get your dog back” program. We are big microchip supporters - we think every dog should have one. 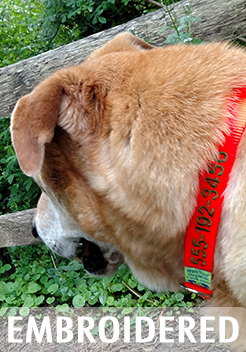 Yet a telephone number on a collar can be read right now,a microchip means a visit to a vet or a shelter. 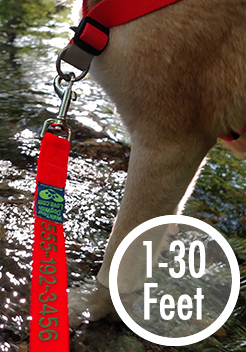 Walk Your Dog With Love's big and easy to read number make connecting a lost dog with its guardian/owner easier and quicker.